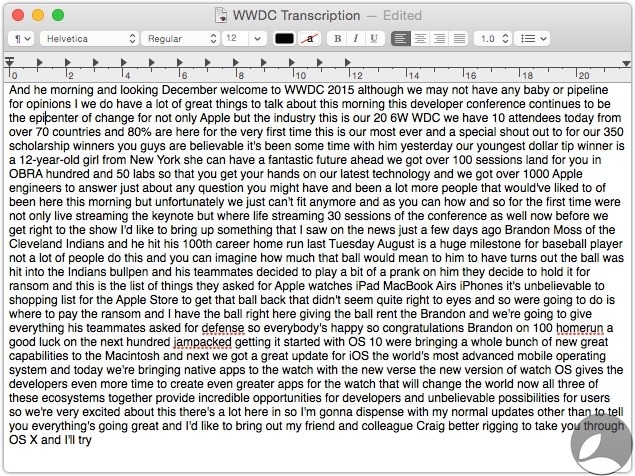 Transcription is an incredibly handy way to save yourself some typing. 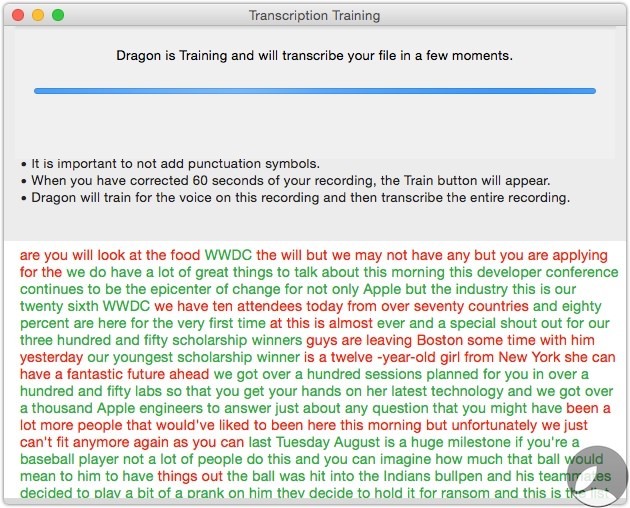 Simply record a persons voice and let Dragon do the work of taken the spoken word and turning into text. There are a few gotcha’s with this. You can only transcribe one persons voice so it’s best suited to presentations, lectures and the sort. Hoping to create subtitles for a home video or transcribe lyrics from a song you’re out of luck. The process to get going is exactly the same as it’s predecessor, Dragon Dictate 4 open up your audio, choose the regions and let dragon do it’s thing. American accents can be tailored to regions. The source file is here btw. 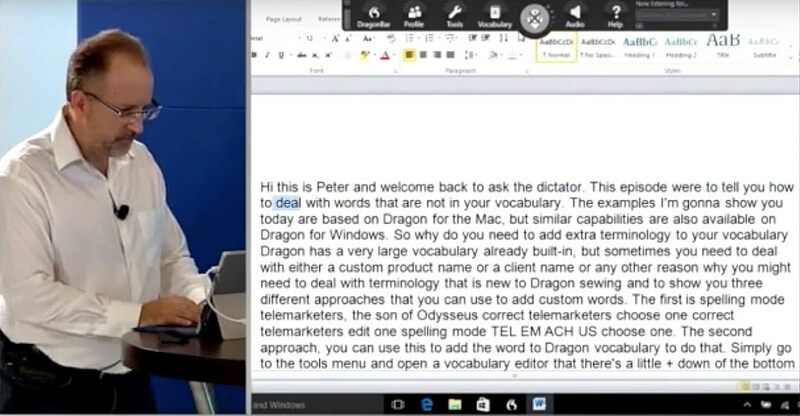 As a fair test I used the WWDC 2015 event, cutting out Tim Cook segments and using the American, Southern accent to give Dragon the best chance possible. Once Dragon has done it’s best guess of working out what’s been said it’s time to edit. Again how accurate the first run really does depend on the source. In the first testing clip I left in the audience interaction, Tim Cook’s stutters and a few other oddities so it’s a real test. Now it’s time to train. As you can see accept takes the text as is or you can edit the odd word. If there’s more than a couple of words wrong it’s best to ignore. Same applies if you can’t make out what’s being said. Don’t bluff it as theres no way to undo the training once committed. ⌘0 – ignore recognised text. ⌘1 – accept recognised / edited text. ⌘⌥↩ – Play / pause. Some of the marketing text will say it will train with just 60 seconds of audio, other marketing bumf says to use 90. 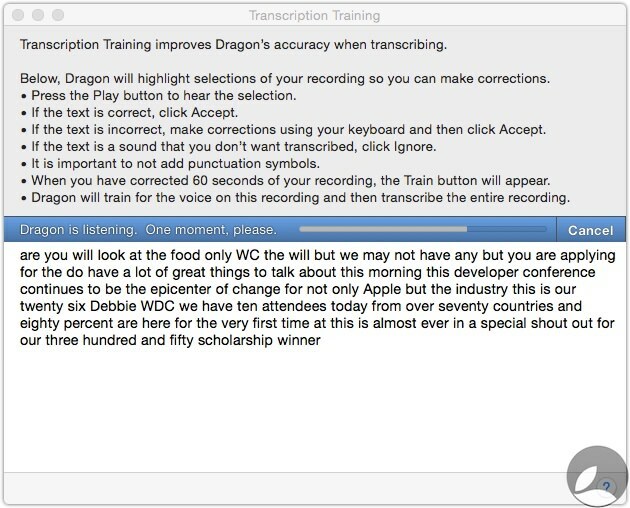 Occasionally if you haven’t recognised enough text Dragon Dictate 5 will load more audio to continue training but what triggers this isn’t documented anywhere. Eventually you’ll end up with something like this. Whilst transcribing Dragon doesn’t assume punctuation, line breaks or anything so you end up with this. 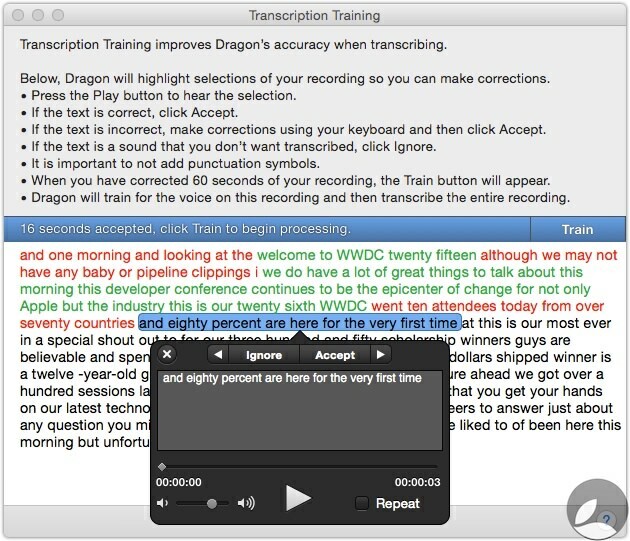 The first 60 seconds are as I edited / accepted what had been recognised and this is where we reach the major bug bearer of Dragon Dictate 5 for Mac. Editing and adjusting text. Sadly being able to listen to audio whilst editing text is a Windows only feature. It’s hard work to go through and edit this, especially since there is no way to listen to the audio at the same time as editing the document. This mean you’re left switching between the transcribed document, finding any errors, switching to an audio player, scrolling to find the point in time where you think the bit is, listening, switching back to the document, editing and then starting the whole process again. This is something myself and many other have complained about in the forums for some time now. Wonder how much time you’ve saved or will save with continual training.